The Every Child Learning (ECLIPSE) program is an initiative intended to increase the number of hours in a day that youth at Lake Bunyonyi spend in an effective learning environment, and to get kids into the classroom whose families or schools might not always maintain the resources to do so. Through the Byoona Amagara Project at Lake Bunyonyi, Uganda, the Sustainable Communities Network (SCN) is making progress on its educational mission. From simple ideas like arranging canoes and drivers for daily student and teacher transport from lakeshore villages to island schools, to developing solar energy to provide extended study hours and power for science labs, to an ambitious school lunch program to feed hundreds of primary school kids who would otherwise leave midday or go hungry in the classroom, to coordinating generous school-fee sponsorships for growing numbers of secondary school students, and to building a school-extension "learning library & telecenter" ...the ECLIPSE initiative is set to become a model for other rural sustainable community programs! The efforts described below, and others, a part of Byoona Amagara's 'ECLIPSE' initiative. In Uganda, where primary education is state sponsored, many youth are schooled up to grade 7. However, this is where education typically ends for a great number of youth - and where school-fee sponsorship is most critical. More often, the struggle for secondary school-fees is a burden that overwhelms many families, and parents are faced each year (or each term) with the dread of deciding which of their children gets to go to school 'this term', and which do not - if any can attend at all. In 2003, Byoona Amagara began coordinating sponsorships of students at various levels of schooling and need, with mostly small informal grants given as gifts by visitors to our community center at Lake Bunyonyi. 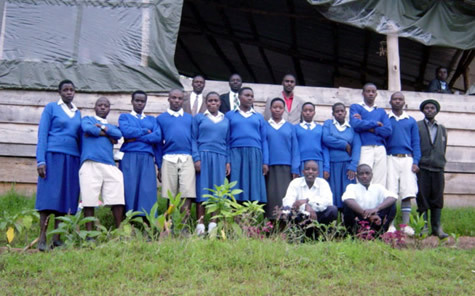 In the years since, the Byoona Amagara ECLIPSE initiative has formalized the sponsorship program, and has been able to increase scholarships to reach over 50 students for the 2007 school year. Each year we now welcome a new class of ECLIPSE scholars entering at the 'freshman' or Senior 1 level. These sponsorships will follow the ECLIPSE students from S1 into S2, and so on until they graduate, as long as they continue to meet criteria established by the scholarship committee. (The committee consists of representative from local school teachers, administrators, parents, students, and the Byoona Amagara project.) It is our goal to grow this program until we have a core of sponsored students at every secondary grade level, from Senior 1 to 6. We will also seek to increase the number of scholarships available at every grade level. As well, we wish to able to supply desperate needly educational equipment and tools, and perhaps funding for additional teacher salaries and training, all in an effort to steadily boost the quality of education at Lake Bunyonyi's schools, and fill the classrooms with eager minds that in many cases might otherwise not be in school at all. ECLIPSE student scholars are highly grateful and accountable to their sponsors, and are expected to maintain favorable academic performance, as well as exemplary behavior and a positive attitude towards their education. Scholarship recipients are guaranteed the first two terms of a sponsorship for each school year. Continuing sponsorship is earned with exercising a committment to their education, and satisfactory performance over the first two terms. Reviews of ECLIPSE student scholars are reviewed after each term, and for those seen to be falling off course, an interview will be conducted and an assessment made as to the cause of any problems the student may be facing, either at school or home, which is impeding performance, or prompting bad behavior. The committee will seek to help such students to overcome their problems before any consideration would be made of cutting off a scholarship. As well, the committee recognizes that not every student can be the best in her/his class, and we believe that every child, no matter their natural affinity for academic performance, deserves at least the chance at a full and complete education. Therefore, we do not require 'top ten' academic performance for a youth to be eligible for a scholarship. However, we do expect that at whatever level the student shows proficiency, that they do not fall from that level, and in fact, we do hope to see an increase - though failure to improve one's standing within the class ranks is not means in and of itself for losing an ECLIPSE scholarship. In the five years we've been conducting this initiative, only two students have lost their scholarship. Beyond sponsoring secondary school fees, the ECLIPSE Initiative also places a focus on getting primary level students into the classroom by finding ways to overcome the various problems that may keep them out. Student transport is a particularly acute problem for the Bwama Primary School on Bwama Island. The vast majority of the school's students (and teachers!) come from the mainland, and very few have the private means to get themselves to the school each morning. The school does provide a few canoes to villages on the lake for the purpose of transporting students to school. However, the school's resources in this area are stretched very thin. There are at least four villages whose kids are in desparate need of transport to the Primary School each morning. So Byoona Amagara decided to exercise its ECLIPSE program in this direction, providing boats and drivers to bring kids to and from the school each day. Since the start of the program in August, 2003, the teachers of Bwama Primary School report their highest attendance since the school opened, and we are now transporting over 100 students a day with our unique 'school buses'! A new effort to be made at Bwama Island schools is 'Solar Studies'. In a place with no electricity, a high demand on fuel of all kinds, and student-teacher ratios of almost 40-1, a longer school day could be in order if only there was light. Byoona Amagara will be seeking avenues of support to enhance the solar electric infrastructure at the Bwama Island schools. The big Byoona Amagara dream of constructing a fully stocked, community interactive learning center at Itambira Island, where many valueable programs will be run, is finally being realized. The 'library' has been built, and will house the Lake Bunyonyi Telecenter, a satellite-linked computer lab and Internet room, where we will seek to build a solid bridge to the rest of the world, right across the digital divide, for the learning excitement of all Lake Bunyonyi's youth.